Superior Solar has been serving Central Florida for over 25 years and we have installed over 18,000 systems throughout Florida. We are the oldest and most reliable solar company in the area. Beginning with our initial consultation to the installation and maintenance in the years after the installation the Superior Solar experience is truly “superior” to any other solar company. That is why more and more businesses use Superior Solar to install and maintain their solar hot water, solar electric and solar pool systems. In our 25+ years of installing solar panels and solar equipment we are familiar with all equipment available on the markets. We know from experience what works and what doesn’t. Using lesser quality equipment usually results in not getting the maximum amount of electricity out of your system and/ or a system not lasting as long as it should. Using top rated equipment is only beneficial if the components holding it together are top quality and can withstand Florida’s humidity, heat, high winds, tropical rains and of course, hurricanes. Lesser quality components tend to deteriorate much faster resulting in a degradation of the entire system. A "cheap" solar system usually ends up being the most expensive one and will yield less energy over the life of the system. Having the largest solar system of its kind in the state, we are putting our money where are mouths are. This is also our test site where we make certain all of the products and components we use on our projects can live up to our rigorous quality standards. We are the only solar company in Florida that tests their products prior to recommending them to their clients. Many manufacturers of solar components rely on our test data for improvements of their products. Our staff is the best in the business. They are highly trained, each having a multitude of certifications. They all are required to undergo continuing education to learn about new installation techniques and new products. We do not use subcontractors. This usually results in a quicker and more seamless building process and eliminates the possibility of “added costs”. From going over your anticipated electrical savings, to pulling permits, to obtaining inspections, Superior Solar does it all for you.. This is beneficial because we coordinate each project in-house reducing the possibility of delays, owner stress and unforeseen issues. Having an experienced licensed engineer design your system will maximize the efficiency of your new solar system and greatly reduce the risk of errors. This is a critical component for maximizing a commercial businesses energy production. We don’t install a system and disappear. We are absolutely committed to your ongoing satisfaction with your solar system whether it is an entire system, solar hot water heater or a solar pool heater. There isn’t any solar issue we haven’t seen in our 25+ years in business and there isn’t any problem we can’t handle. Our service department is available 24 hours a day and 7 days a week for emergencies. Call anytime to speak to a human being concerned with your well being and can help with any issue you may have. 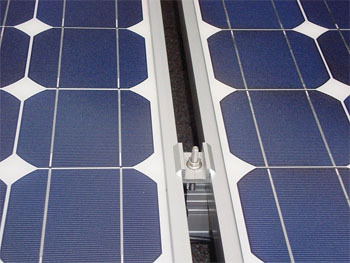 We assemble all of our solar systems and solar panels at our Longwood headquarters. We are so confident in their ability to perform and outlast our competitors products we are willing to back it up with an outstanding warranty. We guarantee the workmanship of every system we install. "I had several companies talk to me about solar panels for the pool and hot water. None of them could do solar electric...and in the end, the Superior Solar pool and hot water installs were 25 - 35 % cheaper than the others. The PV (Solar Electric) was the clincher."